[dropcap]C[/dropcap]aponi Art Park, located on 60-acres of rolling, wooded hills that are embedded with art in Eagan, Minnesota, is a distinctive community space offering cultural and educational experiences in an inviting, natural setting. Designed as a single, unified work of art the meandering trails follow the topography of the grounds like contour drawings animated by everyone who walks them, and the rock walls and shaped hills are the sculpture into which conventional works are integrated. The Park has miles of walking paths, a sculpture garden, outdoor amphitheater — the Theater in the Woods — as well as spaces for reflection and relaxation. Experiencing the Park is, in a sense, Caponi Art Park’s primary program. Learn more about all the park has to offer by visiting our Program and Events page. Caponi Art Park inspires exploration & discovery in all ages! 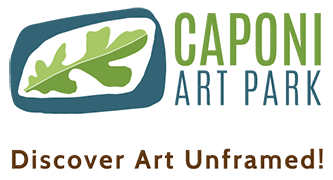 The mission of Caponi Art Park is to restore and nurture the human spirit through art, nature and community. Photography by Donna Kemmet Mueller (left).